Groups & Events Business Intelligence Solution offers one of the most detailed and powerful analysis of the hospitality market for a perfect control of the MICE division in hotels. This solution covers one of the most important areas of hotels (MICE division) in which historically there is a lack of information and very important analysis to do. Thanks to the power of the Hotel Dashboard based on Qlik Sense, the Groups and Events department can now analyze in detail the revenue generation, leads, sales activities and other KPIs of its division, also related to the weight of the same within the hotel or hotel group. A detailed analysis of the operations of the hotels allowed us to discover the relevance of the groups and events within our hotels, knowing in detail the weight of this business in hotel operations, and the areas for improving it. Information such as the conversion of accounts or leads assumes a decisive importance in this solution. But in addition, the way in which the solution is designed thanks to the Qlik Sense product, allows us to delve into any type of detailed analysis giving answer to any question of the user. Other relevant information is group management, since not only is a clear view of the revenue generated in rooms and events offered, but also other indicators such as the conversion of tentative groups to current or final, the conversion time, and so on. In an easy way you can also analyze the work of the sales team. It is easy to see the work developed by each hotel by the sales representative, but also, the level of conversion of the same, being able to reach unsuspected levels of detail. And we must not forget about the KPIs of ballrooms occupancy in hotels. This type of information is not usually available in many of the Events management programs, but in the Hotel Dashboard Groups & Events we include a detailed analysis of the occupation of ballrooms, which can be broken down by type of event, market, region, country, and a long etcetera. Additionally, the information collected in the Groups & Events module can be raw with the other modules of the Business Intelligence Suite, Hotel Dashboard. All the information of charts and tables of the solution can be exported in addition to EXCEL, HTML, or other formats and distributed automatically by mail to the different users of the hotel or hotel chain. 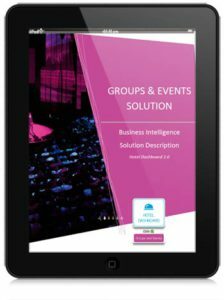 Click on above image to download Groups & Events Business Intelligence brochure (PDF). We work as a single united team with market leading profesionals around the world and give our hospitality clients the highest quality solutions.